because everybody’s summer deserves this salad. all the seasonal goodies I missed! the first official 3 weeks of summer I was traveling for work (Spain + Israel : NO COMPLAINTS!) and then the next couple of weeks I was on the road chasing bands and dancing barefoot in the grass under the stars with my hubby and BFF + a dozen of my other favorite people in the world (also, NO COMPLAINTS! life is good. ) BUT I did miss hanging out in the kitchen, windows open, music on, tinkering around with whatever good things are in season. so now I definitely feel like I have some catching up to do when it comes to summer produce, and time is running out, so let’s get to it! 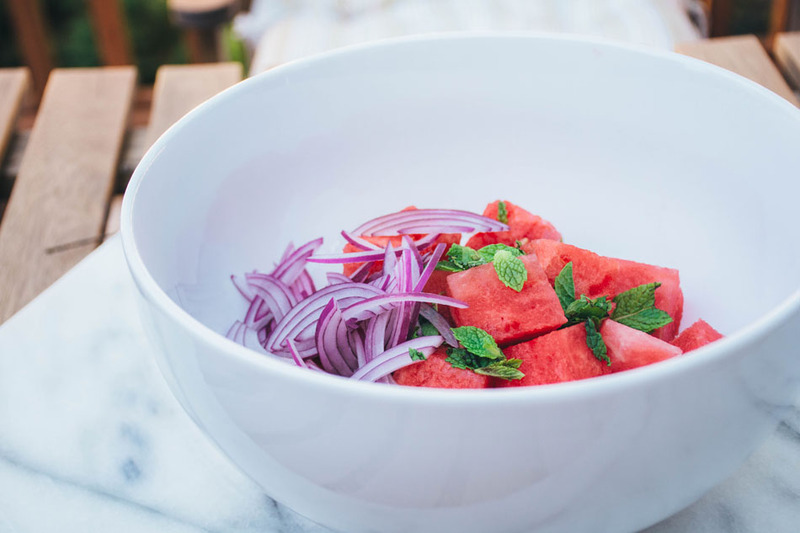 I think a good place to start is right here with this watermelon salad. I know I say this a lot but it’s REALLY easy to make. I like to keep things pretty straightforward around here. and you could actually very easily change the recipe around to fit whatever you have in your fridge or garden. no mint? cilantro would be a fine substitute. no red onion? how about some shallots or thinly sliced green onion instead. 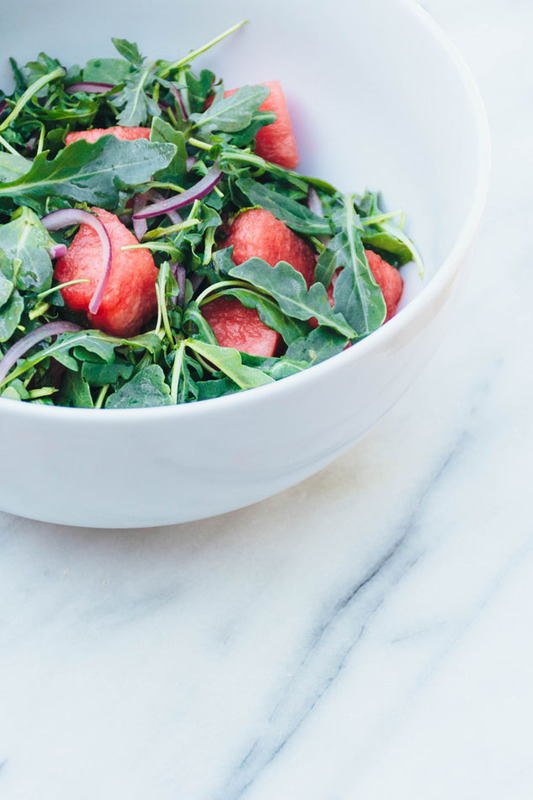 this salad is really the embodiment of simple, fresh, and flavorful food being enjoyed during it’s very peak of perfection. a bright gem to adorn the table that can be thrown together in less than fifteen minutes and goes PERFECTLY with your BBQ goodies. 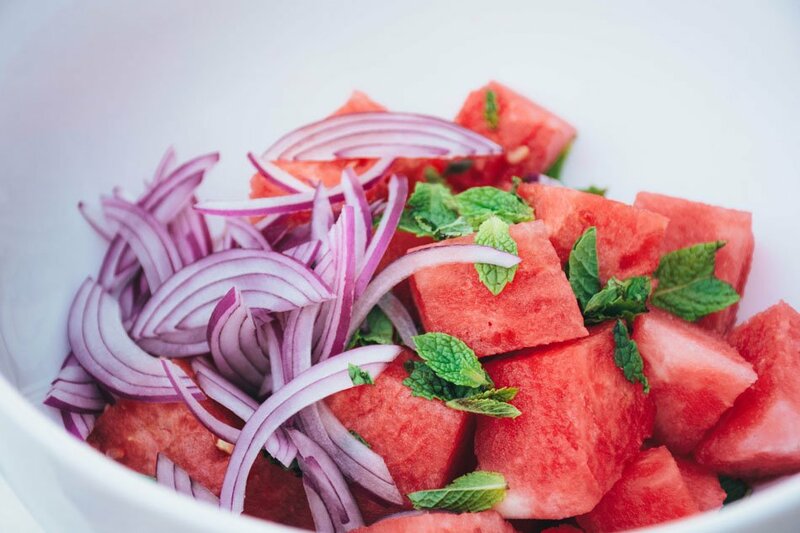 watermelon arugula salad with mint and red onion – a super easy and healthy salad made with juicy watermelon, red onion, fresh mint, arugula and a simple lime vinaigrette. the perfect summer salad! mix salad dressing in a jar or whisk together in a small bowl. 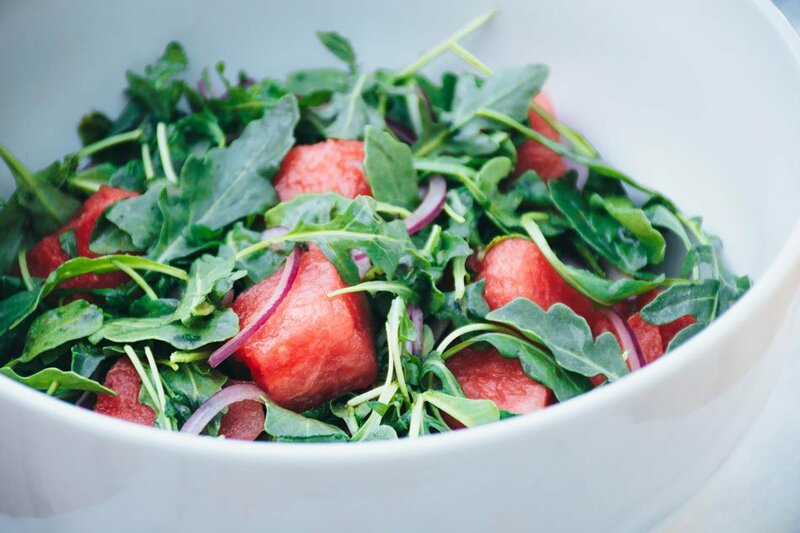 gently toss watermelon, red onion, arugula and mint leaves with dressing and serve immediately! 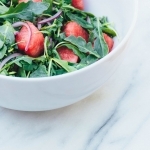 This entry was posted in salads, side dishes and tagged easy, gluten free, healthy, quick, salad, vegan, vegetarian, watermelon on August 16, 2016 by Nyssa Tanner.